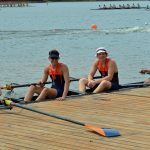 The Bucknell men made their annual return to Gainesville, Georgia, to compete in the 2017 ACRA National Championship last Saturday and Sunday. Despite a small weather delay on Sunday morning, conditions on the 1996 Olympic rowing course on Lake Lanier were great. The regatta would be highlighted by the varsity eight’s 2nd place, the freshmen four’s 2nd place finish, and Nicole Finan’s 7th place finish in the women’s single (her first ever race in the single). The second varsity eight would finish in 3rd place in their Saturday heat, meaning they would have to row in a repechage later that afternoon. Needing to win their repechage over Grand Valley, the Bison charged off the line. Holding a narrow lead the Bison tried to push away, but could not break the Lakers. Grand Valley pushed back and moved through the Bison crew to win the rep by half a length, relegating the Bison to the B final. Bucknell would later finish in 4th in the B Final. The 2v was rowed by Gunnar Vorwerk ’19, Lucas Colagrossi ’17, Mike Pallotta ’18, Thomas Marth ’19, Christian Daugherty ’18, Tom Lanphier ’20, Pat Long ’18, James Koenigsberg ’18, and was coxed by Perry Hamilton ’18. The freshmen four won their Saturday heat easily, qualifying them for a showdown with Michigan and Washington University in the Sunday final. The freshmen would start slow, taking a while to find a rhythm. In the final 500, the freshmen came alive. Sprinting through Vanderbilt and Washington, the Bison came up 1 second short of catching Michigan, earning the silver medals. The freshmen four was rowed by Alex Seel ’20, Matt Brown ’20, Alex Herman ’20, Matt LaRouche ’20, and was coxed by Cami Berlin ’19. Before the regatta this crew was rowing well, but was not quite sure how they would stack up against the competition, since they had rowed in the 3rd varsity 8 all season. They showed some of the excitement that there is in the future of the program at ACRA’s. The varsity four finished in 6th place in their heat, moving them into the reps. Knowing a placed in the A/B semi was at stake, the Bison worked early in the rep to finish in the top two. The other crews were too strong, and the Bison would finish in 5th, moving them into the C final. Unfortunately, due to weather delays the C finals for the varsity four were cancelled. The varsity four was rowed by Gary Tse ’19, Matt McLaughlin ’20, Sam Jacob ’20, Mike Birosak ’18, and was coxed by Cami Berlin ’19. Nicole Finan ’17, the coxswain of the third varsity eight this spring, wanted to row in one of her final collegiate races. She made the brave decision to race the single, and with only a few days of training did very well for herself. She would finish a competitive 4th in her heat, then would win her rep to qualify for the final. Competing against bigger, stronger, more experienced women in the final Nicole would finish 7th. Nicole spent two years rowing on Bucknell’s women’s team before transitioning to be a coxswain for our program. We were very proud to have Nicole represent Bucknell as a rower at ACRA’s in the women’s single, and even more excited to see her racing in the grand final for 7th place overall. This marks one of the most successful ACRA trips in Bucknell history. 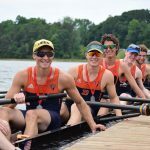 The Bison will now look to close out the season at the Henley Royal Regatta in England, marking only the third time Bucknell has traveled to Henley-on-Thames to compete. The program would like to thank all the team members not attending for a wonderful season. The team would also like to acknowledge some of our athletes; Billy Pinamont ’17, Nick Barpoulis ’17, Dillon LaFata ’18, and John Leasure ’19 were all named to the Mid-Atlantic Region team and will be in consideration for the ACRA All-American team. Additionally we will see a new team captain and co-captain next year, with Dillon LaFata ’18 serving as captain and Pat Long ’18 serving as Co-Captain.